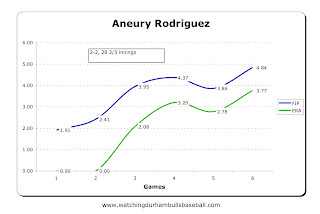 Aneury Rodriguez has been erratic. His first two games were terrific, but he’s been variable since. He lost his last start, but so did every other pitcher on the Durham roster. The Bulls' team FIP is 3.99 and the team ERA is 3.72, so Aneury is one of the guys pulling the numbers up. Let’s hope for a good day. Our opponents are the Pawtucket Red Sox. They come in at 19-23 with a team wOBA of .328. Our team wOBA is .362. Their team ERA is 4.58. Boof Bonser (no kidding, that’s his name), ERA 7.64, is scheduled to start for the PawSox, who have lost the last three in a row. So, we’ve got a statistical edge and we are, after all, the friendly home town crowd.